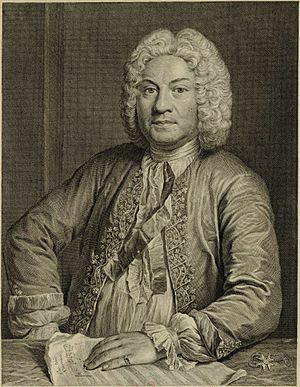 François Couperin (born in Paris on 10 November 1668; died in Paris, on 12 September 1733) was a French composer who lived in the Baroque period. Many of his relatives were composers. He is often called François Couperin le Grand (The Great) because he was the most famous of the Couperin family. He is best known today for his harpsichord music. He wrote several pieces which he called Ordres meaning the same as the word suite i.e. a collection of dance movements. Sometimes these movements have strange titles and we cannot always be sure what they mean. Some of them may have been nicknames of people he knew. He also wrote important organ music. He never had a family of his own before he died. François Couperin Facts for Kids. Kiddle Encyclopedia.